Liverpool host Porto in the 2nd leg of their Champions League last 16 tie at Anfield Road on Tuesday night. Who will win? This article contains our Liverpool vs FC Porto betting preview with predictions, betting tips, starting lineups, team news, highest odds, exclusive betting offers and no deposit free bets on this week's matches! Get 25/1 Liverpool to qualify vs FC Porto (the Reds won the 1st leg by 5-1)! New Customers can get Liverpool at an enhanced 25/1 to qualify to the next round on the UCL. Max Stake £1. Winnings paid in free bets, valid for 7 days, only deposits with cards/Paypal count. Exchange and multiple bets excluded. T&C’s Apply. 18+|Gamble Aware. Liverpool recorded a fantastic 5-0 victory in last month's first leg in Portugal, are all but assured of a place in the quarter finals. The Reds are enjoying a good form in recent weeks as they finished the Premier League weekend in 3rd place, following their 2-0 win over Newcastle on Saturday. As a result, Jurgen Klopp’s side have won all of their last four, scoring 13 and conceding 1 in that time. They also are the top scorers in the Champions League this season with 28 goals. Jurgen Klopp is expected to rest some og his regular starters as he may have one eye on the upcoming fixture against Manchester United. Georginio Wijnaldum and Ben Woodburn both missed at the weekend but they could make an appearance, along with Nathaniel Clyne and Adam Lallana. Emre Can is available after serving one-game suspension in the first leg. The German will start in midfield, alongside Jordan Henderson and James Milner. The front trio is likely to remain unchanged, with Sadio Manè, Mo Salah and Roberto firmino leading the line. Porto have at least responded well to their thrashing, winning four matches on the spin and scoring 15 goals in the process. The winning streak inlcudes a 2-1 win over Sporting Club on Friday night, courtesy of goals scored by Ivan Mercano and Yacine Brahimi. Domestically, Sergio Conceicao’s side are five points clear at the summit of the Primeira Liga table. So, this match could be a chance for the Dragoes to redeem themselves after being embarrassed on their own pitch. They have never won away to an English club in 17 previous attempts, losing 15 times and drawing twice. Tiquinho Soares, Moussa Marega and Alex Telles could all miss out after not featuring while, Vincent Aboubakar is at least back in the squad and Felipe is available after serving a one-match ban in the first leg. Gonçalo Paciência could start in attack, while Jesus Corona and Yacine Brahimi are expected to play out wide. Hector Herrera and Sergio Oliveira will anchor the midfield while Ricardo Pereira may have to deputise at left-back instead of 18-year-old Diogo Dalot. Ladbrokes offer 25/1 ANY Corner to be awarded in Liverpool vs Fc Porto + £5 free bet if you lose!! Our team always strive to select the best odds on every match we preview. Read below the best odds on the Liverpool vs Porto match winner market (90 minutes only)! We also suggest you to take a loot at our price boosts section and see which are the online bookmakers offering enhanced bets on the upcoming matches. 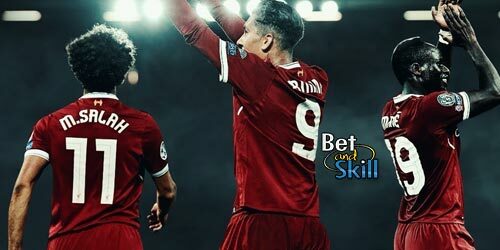 Read below our free betting tips on Liverpool vs Porto, selected by our BetAndSkill professional punters. Feel free to copy our recommended bets and back them on the top online bookmakers! Please, come back to leave a comment at the bottom of this page should you make bash the bookies with the following predictions! Wanna get more free picks on all the Champions League matches? Visit our Champions League betting previews section! "Liverpool vs Porto predictions, betting tips, lineups and free bets (Champions League - 2nd leg - 6.3.2018)"